Home / What’s your wedding dress style? What’s your wedding dress style? If you’re planning a wedding then it’s a pretty sure bet that getting the perfect dress is one of the first things on your to do list. But wedding dress shopping can be hard and it’s not always easy to find the right style for you. With so many stunning dresses available many brides can feel rather overwhelmed! At Wedding Letter Hire we get to see some amazing wedding dresses and we think all of our brides look absolutely gorgeous. But if you’re feeling a bit confused about what type of dress might be ideal for your wedding day then why not take a look at our wedding dress style guide. If you love all things traditional and you want to feel like a princess on your big day then we think that a romantic wedding dress is for you! With a sweeping train, floor length veil and full skirt romantic dresses look amazing at all venues, but work particularly well with a formal wedding hosted in a castle or stately home. With Kate Middleton embodying this classic style we know that it will never go out of fashion. Features on romantic wedding dresses can include lace, diamante and pearls. If you think that this look is for you then you’ll love the Rosa Clara Spring 2017 bridal collection which is full of elegant wedding dresses. If you’re looking for something a bit different for your wedding day and want to put your own unique stamp on your event then a quirky dress is a must. When you break with tradition then nothing is off limits and you could even swap the traditional bridal colours of white and ivory for bright neon shades or even black! Many brides are also choosing to go for a shorter style which is far more practical for boogying the night away after the wedding. We adored the cute vintage style dress that fashion blogger Alex from The Frugalist wore at her wedding recently. The dress was from designer Delphine Manivet but if you don’t have a designer budget then why not take a look around some vintage markets to help you create a totally original wedding day look. Many brides now choose to get married in uber cool urban settings and we’ve taken our illuminated letters to a number of funky locations including the top of the Gherkin in London! Or course in a venue like this you want a chic and stylish wedding dress with an edge. In fact it doesn’t even have to be a dress. Why not channel Bianca Jagger and go for an ultra chic trouser suit? These are all the rage and are practical too! Alternatively you could go for fifties film star glamour with a long fitted dress – the designers Temperley London have a beautiful range if this is your type of style. As you can see wedding dresses can be as varied as the brides we work with. 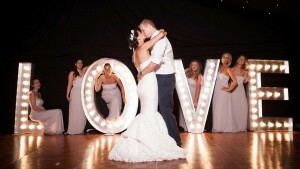 One thing we know for sure is that all our brides look wonderful and as you can see in our gallery our light up letters look fabulous with any wedding dress style too! ← Unique photo ideas for your wedding!